What do kids growing up in the toughest parts of inner-city Baltimore need most? 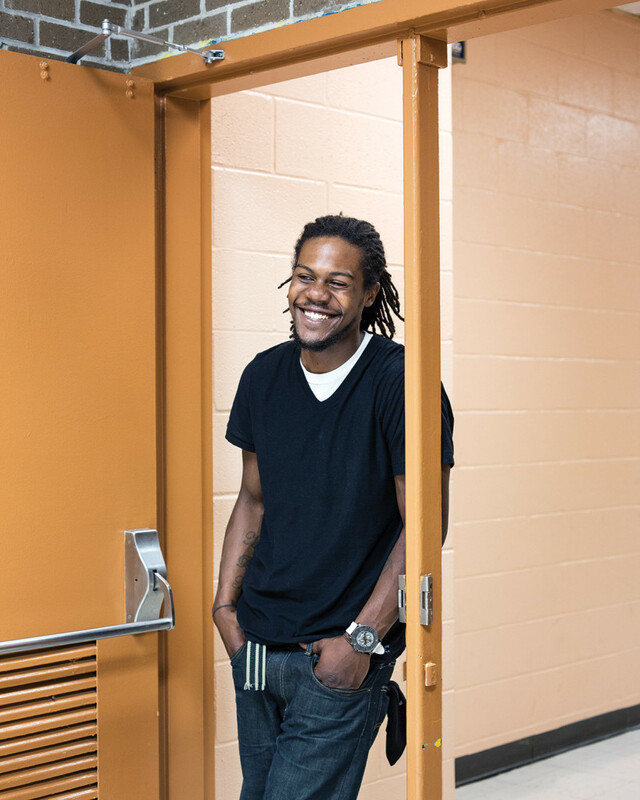 Three guys returned to find out—and changed lives and a neighborhood in the process. The founders of the Holistic Life Foundation, from left: Andy Gonzalez, Ali Smith, and Atman Smith. Baltimore is a city of corners and alleys. At night, the corners in the Western District are lit by the blue glow of police cameras, a crime deterrent. The alleys run through the middle of block after block of Baltimore’s famous row houses, providing sheltered places for kids to play and a quick exit for those with something to run from. The uncharitable might call it a ghetto. The Western District in particular has been beset by poverty, drug abuse, and violence: 34% of the children here, most of them African American, live below the poverty line, compared to 14% in the rest of the state. And while some of the homes here are well kept—the paint fresh, lawns mowed—many blocks are punctuated with abandoned properties, “the vacants,” their windows boarded. The house at 2008 North Smallwood lies in the middle of one of these blocks. This is where brothers Ali and Atman Smith grew up. And it’s here that, with their friend Andres “Andy” Gonzalez, they formed the non-profit Holistic Life Foundation (HLF) in 2001. 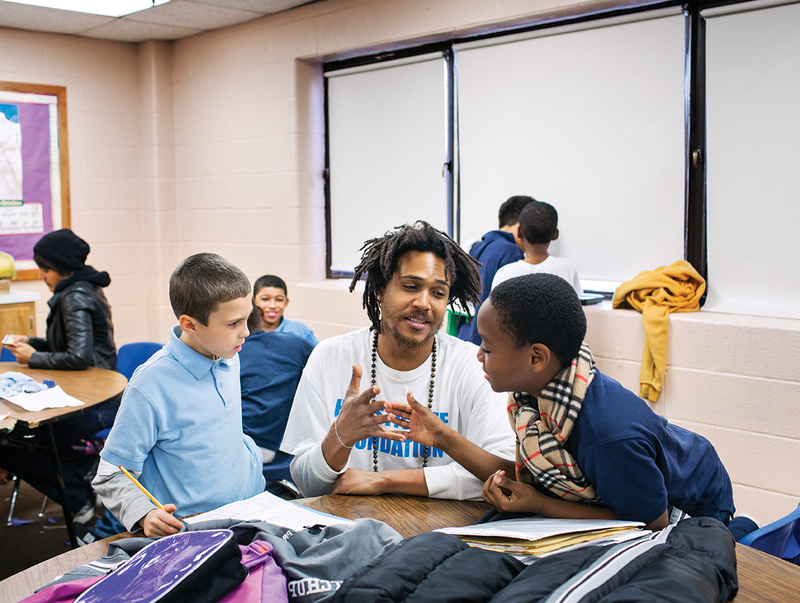 Starting with 20 fifth-grade boys, the foundation’s after-school program introduced yoga, mindfulness, urban gardening, and teamwork to children in the neighborhood in an effort to revive the community through its youngest, most vulnerable members. In a city where the dropout rate for high school students is routinely higher than 50%, 19 of those first 20 boys graduated and the other got his GED. Hundreds of youngsters have now passed through the program. And researchers from Johns Hopkins Bloomberg School of Public Health and Penn State University have begun to study the work being done by the guys at Holistic Life. They’re paying special attention to the program’s effect on children’s moods, relationships with peers and teachers, and emotional self-regulation. After more than a decade, Ali, Atman, and Andy’s work is getting noticed beyond the blocks of the Western District. Down a narrow alley off North Smallwood is The Quiet Place. It’s a former vacant lot, hidden by rows of old houses and decaying cement walls, transformed into a park. HLF did this. There are benches, barbecue grills, garbage cans, blue rain barrels, and a vegetable garden growing tomatoes, basil, beets, cucumbers, peppers, watermelons, cantaloupes, sage, cilantro, lilies, lavender, and a whole bunch of mint. “The city cuts the grass but they’re being kind of slow about it this year,” Ali says. At 36, he has a large presence, laid-back but serious. He’s bald, with a beard that frames his cheeks and chin. He dresses casually. On this hot summer day, he’s in a T-shirt and shiny gold basketball shorts. Then Andy jumps in the car. He’s 33, quick to smile, with a thin beard and long hair tied back in a ponytail. Ali points the car downtown, with Kanye West’s summer smash “Mercy” playing on the stereo. The blocks multiply, empty lots increase, and the city begins to resemble a war zone. “A yoga teacher,” Ali adds. Kaila Winkler practices her breathing. Ali and Andy finished school and moved back to Baltimore in 2001, with Atman joining them on weekends until he graduated in 2002. They knew that their selfless service needed to be here, at home. The answer was the Holistic Life Foundation. Some 20 blocks west of North Smallwood is Windsor Hills Elementary School, where those first 20 boys attended HLF’s after-school program. It was Cassie Smith who introduced Ali, Atman, and Andy to the principal. Cassie has worked in a variety of positions in the local education system, from probation officer for the Department of Juvenile Services to running mentorship programs and professional training. Since then HLF’s program hasn’t changed much, offering the kids a combination of instruction on breathing techniques, yoga, homework assistance, and team sports. The principal at Windsor Hills thought it would be a purely athletic program, but the teachers noticed a difference in the students right away. “The teachers said to me, whatever they are doing, get them to keep doing it,” says Cassie. 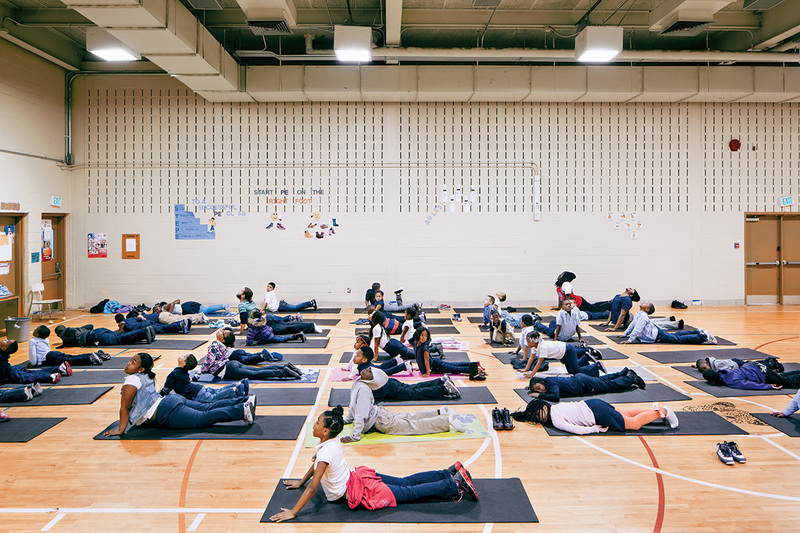 Children practice yoga with Andy Gonzalez (second row, third in from the wall) in the gymnasium of Robert W. Coleman Elementary School in Baltimore. 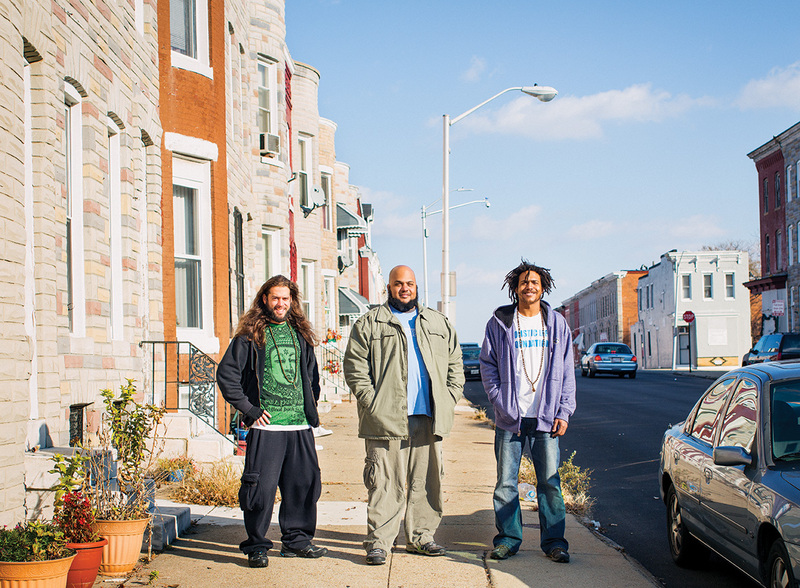 Andy Gonzalez, Ali Smith, and Atman Smith in West Baltimore, where most of HLF’s programs take place. “They’re the real thing,” says Mark Greenberg. “They have this sense of mission that is all their own.” Greenberg is the director of the Prevention Research Center for the Promotion of Human Development at Penn State University. 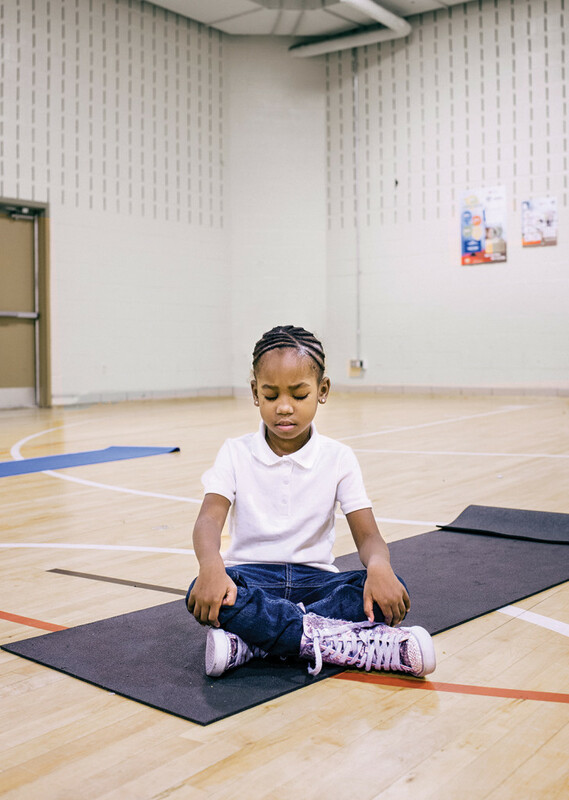 Three years ago, he and Tamar Mendelson, assistant professor in the Department of Mental Health in the Johns Hopkins Bloomberg School of Public Health, conducted a yearlong pilot study on the work HLF has been doing, measuring the impact of yoga and mindfulness on the kids’ stress levels. Greenberg and Mendelson’s study looked at approximately 100 children going through a 24- week program at four different schools where HLF provided instruction during the school day, as opposed to after school. The results were promising. The kids participating in the program showed significantly improved abilities to respond to stress and reported fewer intrusive thoughts and less rumination, the tendency to hash over thoughts in a negative way. Ali and Atman stand in front of 12 children, all sitting cross-legged on their yoga mats in the gym at Robert W. Coleman elementary school. The kids vary in age, boys and girls. One boy is yelling for attention; Ali places his hands on the boy’s shoulders. For the past three years, HLF’s after-school program has been held at this school, just up the hill from North Smallwood, because it’s where so many of the neighborhood kids go. For the 2011/2012 school year, enrollment in the after-school program was 25 at the beginning and rose to 32 by the end of the year. In 2012/2013, enrollment began at 54 and is expected to rise to the mid-60s. Ali, Atman, and Andy are in their 12th year running HLF, which has been slowly expanding. They’ve initiated seniors programs and adult programs at drug-treatment centers and mental-health facilities, adjusting the practices for the demographic. They’ve been invited to speak at conferences and have twice been to Madison, Wisconsin, to teach mindfulness and yoga in schools there. The principal at Frederick Douglass High School, just behind Coleman, wants HLF in his school. With these opportunities, funding for a workforce development program to enable HLF to pay its volunteers is crucial. “We have these young men who have had mindfulness practice for 10 years,” says Atman. “And they are all familiar with the environment in which they’d be teaching.” But the money isn’t there yet. 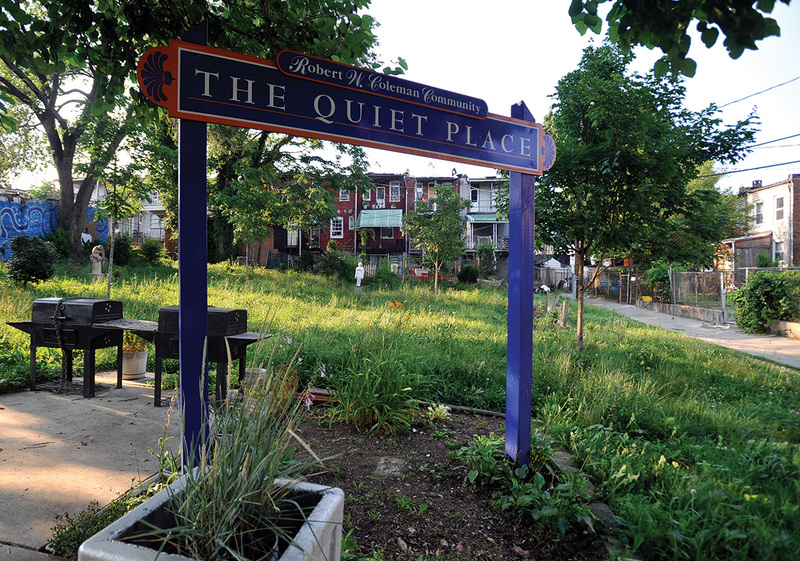 A place of peace in the inner city: HLF’s The Quiet Place. Photograph by Gail Burton. The Quiet Place cookout is a big hit, despite the 100-degree heat of a Baltimore summer. More than 30 people from the neighborhood, including graduates of the HLF program, lounge on the benches, eating barbecued hamburgers, hotdogs, and veggie burgers provided by Ali, Atman, and Andy. Ali’s girlfriend, Nora, and his two boys are there, hanging out. Ali and Atman’s mom, Cassie, is there. As Ali bends over to lift a bag of ice out of the back of the Trailblazer, a boy jumps on his broad back. Atman Smith teaches Eric Denully, left, and Keon Burnett. Since its program started in 2002, the Holistic Life Foundation has made a difference in hundreds of inner-city lives. Three participants tell their stories. This article also appeared in the April 2013 issue of Mindful magazine. Carsten Knox is a freelance writer and former associate editor of Mindful.